Barrel-chested Alain Burguet has been one of Gevrey's most respected vignerons for a quarter of a century. 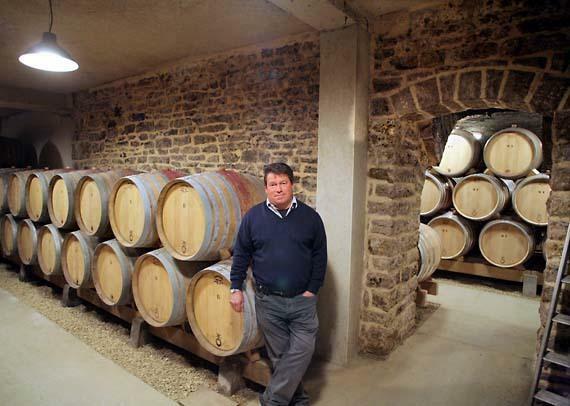 He has been making terrific wines in Gevrey Chambertin for nearly thirty years, during which time his techniques have evolved. He left school in 1964 to work in the vines and made his first vintage under his own name in 1972. Alain is approximately two barrels tall by one barrel wide, and his muscular physique could be seen in the wines he made in the 1980s, where the tannins were occasionally too firm for the fruit. His style has evolved since then, the fruit now being picked later and riper to add a richer dimension to his wines. He is now assisted by his two sons, Jean-Luc and Eric. Most of the 8 hectare domaine consists of village Gevrey Chambertin. Les Justices, En Billard and En Reniard are bottled on their own, alongside two blends – a Gevrey Chambertin Tradition and his excellent 'Mes Favorites', made from old vines and favoured sites. There is also a small cuvée of premier cru Les Champeaux, just 0.18 ha. These are supplemented by three negociant cuvées – Chambolle Musigny Les Chardannes, Vosne Romanée 1er cru les Rouges and grand cru Chambertin Clos de Bèze so that Alain can try his hand at making different appellations. Antonio Galloni sums it all up: Jean-Luc and Eric Burguet "continue to put their own personal touches on the wines at their family's domaine. A focus on biodynamic farming, gentler winemaking, and lower amounts of new oak are all among the recent developments at this small cellar in the heart of Gevrey." They strive to continue their father's legacy of wines that are clean and natural with very little sulfur dioxide, expressive of their terroirs, and above all elegant. The goal for upcoming years is to find vines in a few Côte de Nuits appellations that are 1er Cru and Grand Cru, to further expand their range and to be able to make wines from even more legendary terroirs. Stephen Tanzer 87-89 "A discreet touch of wood spice sets off a very pretty mix of red currant, cherry and warm earth nuances. There is a distinct coolness to the rich and rather suave medium-bodied flavors that possess good phenolic maturity, all wrapped in a tension-filled and lingering finish.